Green Delhi… Breath life to the place we stay! Delhi is synonymous with wide roads and lush greenery. Reportedly Emperor Akbar ordered all roads to be lined with ‘Sheesham’ trees. The Imperial Capital Committee, decided to plant mainly evergreen trees in its new capital. Delhi has some 42 types of ‘native’ trees. The commonest tree is the Mesquite (Prosopis Juliflora), called ‘Vilaiti or Angrezi Keekar’. It was introduced around 1915 from the Central Americas. Emperor Shah Jahan offered special rent-free tenures to proprietors around Sadhaura Kalan, northwest of Mori Gate. Today Jamun trees are found on Rajpath, India Gate and some Luyten’s avenues. Delhi’s numerous gardens, like the Mughal Gardens, Lodhi Gardens, Zoological Park, Buddha Jayanti Park, Delhi Golf Club, Nehru Park, etc boast of over 250 species of trees. • Minimising use of polythene bags. • Celebrating festivals in an eco friendly manner. • Educating citizens about re-use and recycling. The situation has improved 2005 onwards. According to the State of the Forest survey 2009 Delhi (8.29%) comes third behind Lakshwadeep (12.50%) and Chandigarh (9.65%) in the percentage of area under forest cover. Delhi has a geographical area 1,483.01 sq km. Of this 123 sq km is under tree cover. Delhi’s tree cover has increased to 176.58 sq km till 2005. It rose by 16 sq km from 107 sq km to 123 sq km during the 2007-2009 periods mainly due to the government’s plantation drive. The forest cover comprises 6.76 sq km very dense forest, 49.84 sq km moderately dense forest, and 119.98 sq km open forest. New Delhi district is the greenest having the highest forest cover at 46.60 % of geographical area, followed by South Delhi (31.46 %) and South-West Delhi (10.08 %). Asola-Bhatti is the only forest sanctuary in the capital spread over 1,991 hectares. • Delhi ridge has seen shrinking in size due to mining and quarrying activities, especially in the south-central Ridge. • At 1,615 units, Delhi has the highest per capita consumption of electricity in the country. • Apart from the production levels of 785 MGD in 2009, the average shortfall in water is about 200 MGD (million gallons per day) but the percentage of unaccounted for water is 35-40 per cent, reflecting problems in management of resources. • As against 8 private cars per 1,000 persons across India, Delhi has 85 even as the city has seen an exponential growth in the number of vehicles from 30.5 lakh in 1998-99 to 63.0 lakh in 2008-09. Delhi introduces itself through nature and heritage walks along its lush greenery dotted with heritage sites and place of Delhi delicacies. Toshali Holidays arranges, to be with the nature “Walks in Green Delhi”. And customized your accommodation on demand. These walks reveal a side of the mega polis little known – a human side, a human face that needs all nurturing and care that we can afford – to preserve it for posterity. Dev Deepavali is celebrated on the fifteenth day of Diwali. It is a tribute to river Ganga at Varanasi. It is held on Kartik Poornima. The month of Kartik (October – November) has celestial significance. The Ghats of Varanasi sparkle with earthen lamps, lighted amidst chanting of Vedic hymns. Belief is that on the day of Dev Deepavali, Gods come down to bathe in the Ganges. This festival coincides with the Jain festival and Guru Nanak Jayanti. The Uttar Pradesh Tourism department organizes Ganga Mahotsav around this period. Devotees start assembling from the day of the Prabodhini Ekadasi. Celebration is usually held on the Dasaswamedh Ghat. Reputed artists perform to lend a creative touch to the festivities. The ‘Ganga-Aarti’ is an important event in the evening. Almost all Ghats organize their own ceremony. Huge lamps are set ablaze and the priest holds forth the lamp as the multitude chants the hymns. As evening sets in the magical reflection of the thousands of flickering lamps lends a heavenly touch to the ancient city. Karva Chauth sees married women fast from sunrise to moonrise for the safety and long life of their husbands. The fast is observed on the fourth day after the full moon, in the month of Kartik. Karva means diya and chauth means ‘fourth’ in Hindi. Women prepare by buying cosmetics, jewelry and puja items. They fast through the day. In the evening, a women-only ceremony is held. Women dress in fineries sit in a circle with their puja thalis. The story of Karva Chauth is narrated and the song is sung around an idol of Gaur Mata or Parvati. Once the moon is visible, the fasting woman view its reflection in a vessel filled with water, through a sieve, or cloth. Water is offered to the moon for its blessings. She then views her husband’s face in the same manner. On this occasion of Vrat (Fast) a Kalash (small container) is filled with either milk or water. In that Kalash Pancha Ratna (Five different pieces of different metals (gold, silver, copper, brass and iron) then this kalash is presented to Brahmin and also it was exchanged with other married women. After it women offer prayers to Shree Lord Ganesh : “Let the offerings of this Karva bring life to my husband and may my Saubhagaya be everlasting “and express such desire that ‘May my death precede that of my husband so that I can enter the chitaa (funeral pyre) as a bride (not as a widow). According to legends this narrative was took place between Shiva and Parvati. Shiva told its significance. Queen Veervati was misled into breaking her fast and the king, died. The Goddess instructed her to repeat the Karva Chauth fast and Lord Yama was forced to restored the King’s life. In another variant of the Goddess Parvati gave back the life of the King. In Mahabharata, i.e Dwapar Yuga, Draupadi is said to have observed this fast on the advice of Lord Krishna. In another legend there was a woman named Karva, who was deeply devoted to her husband. While bathing at a river, her husband was caught by a crocodile. On Karva’s prayer Yama revived and blessed them with long life. Delhi, is an epicureans’ paradise. The diverse range of cuisines makes Delhi a gourmet’s delight. Delhi offers a mixture of North Indian, Mughlai, Punjabi cuisine and mouth watering street fare. Where else would you find a street named after flatbreads? Parathewali Gali. By the way if you are down there try the Papad Paratha. Street food is the mark of any city – Sitaram Diwanchand’s chole Bhatures, Kuremal’s Kulfis since 1908, Moth Kachori of Multani Dhanda, Jain Sa’ab’s kachoris, Pakorimal Doodhwala’s Milk and Lassi, Bade Mian’s Kheer, Kinari Bazar’s Khurchan, Kulle chaat of Chawri Bazaar, Daulat Ki Chaat, Japani Samosa, Fruit Sandwiches at Jain Coffee House, Giani’s Faluda, Keema Samosa, Sutli Kababs etc. Ghantewala’s Sohan Halwa has been tickling taste buds since 1709. The royal elephant reportedly refused to budge without his daily dose of Ghantewala’s sweets and he used to shake his head to ring the bell tied to his neck to demand sweets. So the halwai got the name Ghantewala. The place to seek variety in Mughlai food is in the Old city area – Karim’s and Al Jawahar are famous but many an unsung Kababchi or Biryani Wala will surprise you. Delhi has a big migrant population from all over India. Earlier eateries at state houses served their regional delicacies. Sarvana Bhavan is particularly well known for Andhra cuisine. In CR Park at South Delhi area cuisine from Bengal dominates with cutlets, rolls and sweets having a field day with the varieties of fish on offer. In fact all the state houses have eateries – little known but tasty fare. Regional cuisine is finding its foothold slowly – in restaurants like Brown Sahib and the Gunpowder. If you are willing to seek out, Delhi has a lot to offer on the culinary trail. For example the Afghani food joint in Lajpat Nagar or the Russian place – Bline, Korean food at Sun and Moon or the Gung in Green park, or excellent Continental fare in the Metropolis restaurant. Chandni Chowk is a different dimension all together. “No ads, no frills, great food – great prices” says the nameless milk cake shop of Kucha Ghasi Ram. Kashmiri Kebabchi opposite to the Shan Masjid and Bade Mian’s are famous and few gems in this treasure chest of good food. Commenting on delicious dishes like Biryani is a bit difficult. It is a touchy subject and diehard Lucknavis will pay little heed to Dilli’s fare and Hyderabad is and Kolkattans will swear by their fare but a trip at Hazi Noor Mohammed near Turkman gate or Babbu Bhai near Matka Pir might convert a few. Similarly Lucknow’s ‘Kakori Kebabs’ has a competitor in Dilli’s Gola Kabab of Mian Sahib near Jama Masjid. Another, landmark “Delhi Haat” Near INA Market and Netaji Subhas Place, showcases India’s rich handicrafts and regional food heritage from all the Indian states. It’s a must visit for handicraft and culinary buffs. Writing about a diverse and well researched subject like Delhi’s food at best is a difficult task. Eminent food critics have dedicated entire blogs on the subject but only few desperate writers would be able to condense Saadi Dilli’s food in such a short span. It is only my fascination for food and lack of a meaningful ‘Adda’ that I am accustomed to have made a lazy fellow like me to amble across to some of these heavenly eating joints. The experience of describing a Gola Kabab dissolve in your mouth would strain my modest vocabulary and perhaps offend the non carnivorous type. But I would like to hear it from you – your experience, be it an obscure Kachori Wala or a Kulfi Wala – you know the place to tell me all about it – so I might log some more food travel miles. Share this with your friends, colleagues, relatives travelling to India and you want to taken out for best cuisines in Delhi. Delhi is a rough triangle formed by the Aravallis in the west and river Yamuna in the east. Settlements dating back to Stone Age has been uncovered. Its magnificent monuments span a period of almost a thousand years. Different dynasties built their capitals here. Archaeological evidence points to between 8 to 12 sites in and around Delhi, where a new city was built. Some of them are Lal Kot and Quila Rai Pithora in the early medieval period; Tughlaqabad and Kotla by the Sultanate rulers, the Mughal capital of Shahjahanabad and New Delhi, by the British. Many heritage historians have mentioned that Delhi was also the site of the capital of the Pandavas of Mahabharata – Indraprastha. Folklore goes that the present Purana Quila or Old fort of Delhi stands over the site that was once Indraprastha. The Tughlakabad fort built by Ghyasuddin Tughlak was once an imposing structure. The last ruler of the Tughlak dynasty Feroze Shah ruled for 37 years. He built a fort Ferozeshah Kotla, a fort which has no remnants today. The Ferozeshah Kotla – scene of many major cricketing duels stadium stands today on the erstwhile site of the fort. Feroze Shah is also credited with building the top two floors of the Qutab Minar when lightning destroyed in 1368. There are three World Heritage Sites in Delhi. • Red Fort: Built by Shah Jahan, between 1638 and 1648. It houses the Diwan-i-Khas and the Diwan-i-Am, the Rang Mahal, Moti Masjid etc. • Humayun’s Tomb: Built in 1570 AD by Humayun’s wife Haji Begum. It is a standout example of Mughal architecture. • Jama Masjid: Constructed in 1656 AD under the guidance of the Prime Minster of Shah Jahan, Saadullah Khan. Besides these, the Qutub Minar and Quwwat-al-Islam (Might of Islam), the earliest extant mosque in India graces Delhi. The Jantar Mantar – an astronomical observatory was built by Maharaja Sawai Jai Singh II of Jaipur in the year 1724. Safdarjung’s tomb and Madrasa enrich Delhi’s heritage. There are many hidden gems of historic monuments here. The Khirki Masjid (Mosque) in Saket is a small but uniquely designed mosque. The Dargah of Sufi saint Qutubddin Bakhtiyar Kaki near the Qutab and ‘Agrasen ki Baoli’ in the middle of Connaught Place. The capital is one of the greenest capitals and the gardens here reflect the eclectic taste of its erstwhile rulers. “Mughal Gardens” inside the President’s estate is one of the best laid out, the beautifully landscaped “Lodi Gardens” encloses the tombs of an imperial dynasty. The Old city has “Begam Ka Bagh” – appointed by the eldest daughter of emperor Shah Jahan – Jahan Ara – the last remnants of it are now parts of the Gandhi park near Chandhi Chowk, “Roshnara Gardens” was laid out by Jahanara’s younger sister Roshnara in 1650 – the garden would be later infamous for her amorous exploits and would bear the pathos of her slow, painful death by poisoning in 1671. “Shalimar Bagh” was appointed by Akbarbadi Begum – the favourite wife of Shah Jahan after Mumtaz Mahal. “Qudsia Garden” was named after begum Qudsia and Tees Hazari was named after the number of trees in the garden appointed by the builder emperor Shah Jahan. Each place has its unique historic significance – “Gurdwara Sheesh Ganj” remembers a martyred Sikh Guru while “Khooni Darwaza” is where Bahadur Shah’s sons were executed. Every nook and corner of the old city has a tale to tell. In the walled city the “Neharwali Haveli” at Darya Ganj is where Gen. Parvez Musharraf was born, the “Churiwali Haveli” of Begum Samroo (Begum Sombre actually) who rose from a courtesan to a Zamindar, or around the corner in Ballimaran, the haveli which saw the last days of the unparalled Urdu poet Mirza Ghalib. Cutting to modern times the India Gate, Lotus temple, Akshardham stand out as landmarks. The Festival of Aanvla Navmi is very significant festival of women. On this day women perform special Puja and pray before Indian Goose Berry for the success and welfare of their family on the day of Aanvla Navmi. If women are not able to find Goose tree in close vicinity of the house then a small branch of the tree can be brought to the house for performing puja. Indian Goose Berry Tree or Aanvla (Amla) tree or branch of the tree. On the day of the Puja, women rise up early in the morning and then take a bath and wear new or washed clothes. This puja is performed in a particular direction. There is custom to do Puja while facing towards east direction. First, water is offered to the tree followed by Jaggery, Chawal, Batasha, Aanvala, Moli, Roli, Milk, blouse and some money is brought. All Ladies put tilak on their forehead. There is special trend of Parikrama is practiced in which women revolve around the tree for eight or 108 times while moving they wrap the raw white thread or red moli around the Aanvla tree. After performing Parikrama. All women sit together and read or listens Katha associated with Aanvla Navami. Dhup (Lamp) are lit before the tree then all ladies put tilak (Auspicious red color Mark by roli) on their forehead. The special trend of Parikrama is practiced in which women revolve around the tree for 8 or 108 times and while moving they wrap the raw white thread or red moli (Red sacred thread) around the Aanvla tree. After performing Parikrama, all women sit together and read or listens Katha associated with Aanvla Navmi. Katha of Bindaayakji is read after the katha of Aanvla Navmi. There is also the practice of keeping few grains in the hand during katha and later placed in Kalash filled with water placed near Aanvla tree. There is also tradition of inviting the Brahmini for food and presenting clothes and money. If you feel, we have missed any information that is helpful for your friends visiting this blog, do post. We would be glad to receive your comments and conversation.. We are looking for photos of Aanvla Navmi Festival, please fell free to post. Mahatma Gandhi in Orissa… A tribute.. It means.. Lord Rama, Chief of the house of Raghu, Uplifters of those who have fallen, (O divine couple) Sita and Rama, Beloved, praise Sita and Rama God or Allah is your name, Lord, bless everyone with wisdom. Before he became Mahatma, Mohandas Karamchand Gandhi, travelled throughout India to understand the people of this country. On Gandhi Jayanti on October 2 we honour the memory of this ‘Mahatma’. There is a temple in Bhatra village, in Sambalpur. Mahatma Gandhi is worshipped there. The priest is a Dalit. The temple was the brain-child of ex MLA Abhimanyu Kumar. When he became MLA in 1971, the idea of a temple dedicated to the man who abolished untouchability inspired him. Between 1921 and 1946, Gandhiji visited Orissa eight times. The response was spontaneous and overwhelming. He along with Kasturba Gandhi arrived in Cuttack on Dola Purnima (Holi) March 23, 1921 and addressed three meeting – at Kadam-i-Rasool, at Binod Bihari and a mammoth meeting on the riverbed of the Kathjodi. He travelled to Bhadrak, Sakshigopal and Puri. Accompanied by Gopabandhu, he left for Berhampur on March 29, 1921. Gandhi’s second visit to Orissa was on the request of Madhusudan Das on August 19, 1925. Gandhi would influence people like Utkalmani Gopabandhu Das and Madhusudan Das greatly. His fortnight long tour of Orissa for the propagation of khadi started on December 4, 1927. He had high blood pressure and he rested in the house of Madhusudan Das. He left Cuttack on December 21 to attend the Congress session at Madras. In 1934, Gandhiji began his celebrated “Padayatra” with the mission of harijan upliftment and abolition of untouchability. He visited Orissa twice in this connection. During his visit of March 25, 1938, Kasturba, Durgaben, Sardar Patel, Maulana Azad, Rajendra Prasad, Acharya Kripalini, Mahadev Desai accompanied him. They addressed the annual conference of Gandhi Seva Sangha and the Utkal Khadi and Village Industry exhibition at Berboi, near Delang in Puri. On January 20, 1946, Gandhiji passed through Orissa on his way from Calcutta to Madras. He addressed the assembled crowds at Cuttack and Berhampur. This was his last visit to Orissa. Gandhiji was moved to tears when the famine-stricken people of Puri contributed a paise or an anna for the Tilak Swaraj Fund. Gandhiji said, “The famine-stricken skeletons of men and women in Orissa haunt me in my waking hours and in my dreams. Whatever can be useful to those starving millions is beautiful to my mind. Let us give today first the vital things of life and all the graces and ornaments of life will follow”. In a fitting coincidence the Mahatma’s ashes were preserved in Orissa for long. An urn with his ashes was kept in the Puri Raj Bhavan from February 12, 1948 to June 27, 1948. Then the urn was preserved in Cuttack, at the Imperial Bank of India – later the State Bank of India till his great grandson, Tushar Gandhi, immersed them in the Ganges at Allahabad in 1997 – on the Mahatma’s 49th death anniversary. Gandhiji is Mahatma because he taught the country pride; his ideals stand out in a world torn by strife. He was not god, neither had he claimed such. He practiced what he preached and ended the journey as the Mahatma – a long way from a young lawyer treated inhumanly in foreign soil. With his life he taught us that to be superman you need have only humanity and humility. Does not some scripture say – “the meek shall inherit the earth”. His life shall be a lesson for all for ages to come and India shall be proud of the Mahatma who imbued the ideal of oneness in multiplicity. To Commerate and Celebrate Gandhi Jayanti on 2nd October’2010 (Saturday) – the Birth anniversary of Mahatma Gandhi. Toshali Resorts invites you to Gandhi Jayanti, the National holiday Weekend Getaway at Toshali Sands, Puri India. For Reservation click on http://bit.ly/9R2Sda . You can also contact your travel consultant metu@toshali.in to plan you weekend getaway vacation. If you feel, we have missed out on any information, do post in your comments, and we would be glad, if you can share this blog with you friends at Facebook, Twitter, Google Buzz, Myspace, and other Social Networking Sites. Many people around celebrate the United Nations’ (UN) World Tourism Day, every year on 27th September, World Tourism Day is celebrated. This day aims to foster awareness among the international community of the importance of tourism and its cultural. The institution of World Tourism Day (WTD), decided by the General Assembly in 1979, has the aim,through a series of appropriate events, freely organized by each member and other authorities wishing to become associated, of heightening public awareness of the social, cultural, political and economic values of travel and tourism. Since 1980, worldwide annual event began – has, applauds to members’ initiatives over the years, allowed a list to be drawn of activities at many levels that could be carried out to mark World Tourism Day. Many tourism enterprises and organizations as well as government agencies with special interest in tourism celebrate the event with various special events and festivals. Different types of competition held there such as photo competitions promoting tourism, as well as tourist award presentations in areas like ecotourism, free tourism. Declaration of World Tourism Day (WTD) as a “Special Day for the entire national territory” around the World. Heads of State and government messages addressed to their fellow citizens, suggesting that they should specially think about the theme chosen for, making the most of this occasion, of WTO activities in favour of tourism development and promotion. Marking World Tourism Day, the Head of State or government in their Messages, with conferences, distribution of prizes to the best contribution on tourism (composition, photography, drawing, film, video cassette, poster). Free entry for tourists and citizens to museums, national parks and other sites of tourism interest. Public transport special tours, fares and decorations to highlight on the World Tourism Day activity. Organizing a competition to increase public awareness. Organizing tourism fairs and meetings to coincide with World Tourism Day. Special welcome reception for tourists during the Day, with the cooperation of hoteliers, restaurateurs and tourist guides: special attention to tourists. The issue of commemorative postage stamps and medals. Dussehra is dreived from Dasha-Hara “remover of bad fate”. It is celebrated on the tenth day of the bright fortnight (Shukla Paksha) of the Hindu autumn month of Ashvin. Lord Rama appeased Devi Chandika seeking to defeat and kill Ravana. On Dussehra day Ravana was killed in the battlefield and this day celebrates the victory of good over evil. In another mythology Devi Durga killed mahisasura on Dussehra day. It marks the traditional season of autumn. Soma Yajnas are performed with the Maha Surya Mantras and the Aruna Prapathaka of the Yajurveda. The effect of these mantras is to keep the heart, brain and digestive functions of the body in balance. The imbalances in these occur in the absence of adequate sunlight in the winter months. the nine-day old sprouts (called noratras or nortas) are used as symbols of luck. In Uttarakhand, Dasshera festival starts with the performance of Ramlila which is itself unique as it is based on the musical rendering of the katha or story of Lord Ram based on the theatrical traditions set by Uday Shankar while on his stay in Almora these traditions were further enriched by Mohan Upreti and Brijendra Lal Sah. Known as the Almora or Kumaon style Ramlila has been recognised by UNESCO in its 2008 report as one of the representative styles of Ramlila in India. Kullu dussehra at the Dhalpur maidan is now famous for the spectacular procession and fairs. The Gaddis – semi nomadic shepherds comes down to perform. In Himachal Gods are carried in palanquins to local fair grounds. During the Kullu festival some 22 deities make their way to the fair grounds. The history of this festival goes back to 17th century when king Jaganand installed an idol of Lord Rama on his throne. Since then Lord Raghunath is the presiding deity of the valley. Dussehra in Kullu begins after celebrations are over elsewhere in the country, because, the legend has it that “Lanka Dahan” was done on the day after a full moon night, which according to the Hindu calendar falls after the seventh day of the Vijyadashmi. Chamba and Nurpur also has similar celebrations. However, Dussehra is not celebrated in Baijnath dham of Lord Shiva. It is believed that Ravana put a consecrated Linga on his journey back to Lanka. Lord Shiva had actually asked him not to put it down anywhere. Ravana inadverently put it down in Baijnath and it is there ever since. The current temple was constructed sometimes around 1204 AD. In autumn the hills are a riot of colours. In Kinnaur there is a festivall of flowers – ‘Fuleich’ and ‘Sair’ in the Kangra area. Traditional fairs with buffalo duels take place in Mashorba near Shimla. You can simply put up your feet and see days go by, take a local tour for attractions that are not part of usual tourist calendar – it would be an unforgettable experience and memory to cherish. If you feel, we have missed any information that is helpful for your friends visiting this blog, do post. We would be glad to receive your comments and conversation.. Happy Dusshera festival. It means… Goddess Durga is omnipresent. She is the personification of Universal Mother. She is a Mother, who is present everywhere and who is embodiment of power and energy. Great mother, who is present everywhere and who is embodiment of Peace. I bow to that mother, I bow to Mother Durga, I bow to Shakti. Lord Rama prayed to Devi Chandika seeking victory over Ravana. One blue lotus short he offered his eye to please the Goddess. In Mahabharata Pandavas ended their year of anonymity on Dussehra. According to the Puranas, King Suratha worshipped Durga in the spring. 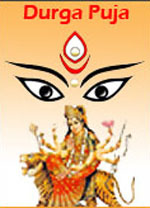 Durga’s ten hands represent ten directions. Her three eyes represents – left eye desire (the moon), right eye represents action (the sun), and the central eye knowledge (fire). • She rides the lion, representative of power, will and determination. • Conch symbolizes the ‘Om’. • Bow and arrows represent energy. • Lotus symbolizes certainty of success but not finality. • “Sudarshan-Chakra” of Lord Vishnu signifies that the entire world is subservient to her will. • Trident or “trishul” is symbol of three cardinal qualities – Satva (inactivity), Rajas (activity) and Tamas (non-activity). The rendition of Shri Chandika- in Mahalaya, reveals the coming of this primeval, divine mother “Yah Devi Sharbabhutesu…… Matri Rupini Samasthita. In Orissa and Bengal Mother Durga is the married daughter, on an annual visit to her father’s place, with children. The puja in its present form started by Raja Nabakrishna Deb of the Shobhabazar Rajbari of Kolkata in honor of Lord Clive in 1757. Clive wished to pay thanks for his victory in the Battle of Plassey and the only church in Calcutta was destroyed by Siraj-ud-Daulah :). With changing times the pujas have become community affairs. In Orissa and Bengal, Durga Puja is the principal festival. People come home on vacations. On Vijaya Dashami, which coincides with Dusserah the idols are taken out for ceremonial immersion. Before she leaves maidens and housewives gives her a sendoff with sweets and betel leaves and nuts. Along with the sendoff there is also an entreaty to return early the next year. As per Markandeya Purana Chedi King Suratha started Durga Puja around 300 BCE. The Chedi dynasty belonged to Kalinga (modern Orissa). A sculpture in the Jagannath temple also shows the Goddess being in the same pedestal along with Lord Jagannath and a king kneeling before them. The present form of worship started during the reign of Ganga King Chodaganga Dev in the 11th century at Puri. Sometimes around 1512 (some say 1517, others 1505) Sri Chaitanya Mahaprabhu had come to Cuttack during the reign of emperor Gajapati Pratap Rudra Dev. He started Durga puja at Binod Bihari temple, now known as Balu Bazar. The first recorded Sarbojonin Durga Puja in Orissa dates back to 1832 in the Kazi Bazaar area of Cuttack. The Kar family of Balasore started Durga Puja in 1852. The Puja is celebrated in two different ways. In Shakti peethas (temples) it is observed with strict rituals laid down by the scriptures for 10 or 16 days known as Shodasa Upachara or Shohala dinatmaka. It starts 7 days before mahalaya called as mulastami and ends on Vijaya Dashami. In communal puja mandaps rituals are followed on a lesser scale. A pandal in Oriya is called “Medho”. The most expensive installation was the ChaandiMerrha (Silver plated) of Choudhuri Bajaar, Cuttack. These days it is all gold plated, so the new name “Suna Medho” (Suna=Gold). The Durga Puja festivities are also prominent in Maa Katak Chandi Temple. She is the presiding deity of Cuttack. People believe her to be ‘The Living Goddess’. Puri wears a festive look during the Durga Pujas and Dushera. Roads are illuminated and large pandals are extensively decorated. On Panchami preparations arealmost over. The Goddess is established in the mandap on Sasthi. Asper mythology the final stages of the battle was fought during Ashtamiand Navami. Ritual worship is done. It is nothing sort of ecstacy. Everyone is dressed in new dresses, fineries. Community Pujas see huge crowds. Cultural programmes are dished out. The earthen idol of Mahishamardini Durga is known as Gosani and the Dussehra fesival is known as Gosani Yatra. The co-worship of Mahisamardini Durga with Lord Jagannath is prevalent from 11th century, in Puri. Gosanis are aspects of Durga during her battle with mahisasura and have their origins in the folk culture. On the following day of Dusshera the Goshanis from all the sahis (streets) come together in procession in front of Shree Jagannath Temple to pay tribute to lord Jagannath. This is known as ‘Bhasani Yatra’. Huge crowd gather to celebrate Bhasanai Yatra. In late night the idols are taken for immersion. Puri witnesses an unique scene of over 150 idols lined up for immersion. Is this the largest known congregation of Durga idols anywhere? The world famous sand artist Sudarshan Pattanaik creates his own idol of sand in the Puri beach every year. Durga Pujas means festive holidays, vacation and a time to travel. Other than the summer vacations this is the longest vacation in the region. People from Bengal, Bihar, and Jharkhand have visited Puri for millennia. The abode of Lord Jagannath is thronged with visitors throughout the year and other than the Rath Yatra the number is highest during the Durga Pujas. Puri is rediscovering itself a new with plush new resorts and inns and added modern comfort and amenities for visitors, tourist and guests. In Western India, especially Gujarat, the navaratras see performanceof Garba and Dandiya. Women dressed in traditionally, dance around an earthen pot with a lamp inside. The pot symbolises the womb – “Garba” and the lamp inside – life. In Dandia men and women participate in pairs. Kumbhaklaran and Meghnad symbolizing the triumph of good over evil. During Dusshera celebration of Mysore Devi Chamundi, the presiding family deity of the Maharaja of Mysore is taken in a grand procession to the hilltop temple. Special Trains for Durga Puja 2010 between Puri and Howrah New Delhi and rest of India. To clear the extra rush of passengers during Durga Puja 2010, Indian Railways will run two pairs of weekly Puja special trains between Puri and Howrah. These special trains will start running on 7th September 2010 and will end on 29th December 2010. Durga Puja itinerary followed with Laxmi Puja as per Kohinoor Panjika of Orissa of 2010-11.